Ahhh, fall. It’s a magical time of year. The air gets crisp, cute scarves and boots come back into vogue, and that rare, magical creature, the pumpkin spice latte, makes its first appearance. Pumpkin spice latte lovers of the world, rejoice! It smells so good you just want to rub your face in it! Oh wait, now you can? I did some experimenting and turns out, a pumpkin spice latte sugar scrub isn’t just doable, it’s also incredibly moisturizing and so good for your skin- especially in helping with aging and acne! And did I mention it smells amazing? This is the skin care item you didn’t know you needed until now. It exfoliates. It moisturizes. It’s energizing. It smells INCREDIBLE, and it makes all your dreams come true. Honestly, I think a PSL scrub is better than an actual pumpkin spice latte… What they call ‘pumpkin spice’ is actually just artificial flavoring- an unnatural mix of chemicals, with plenty of sugar on the side. Actually, it’s probably mostly sugar. Expensive sugar. You don’t need those toxins in your life! 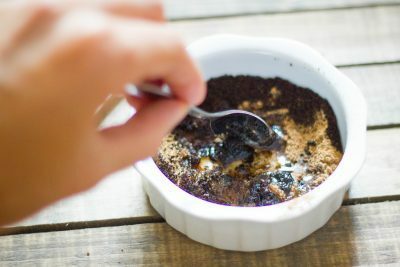 Making a sugar scrub has never been easier or yummier! 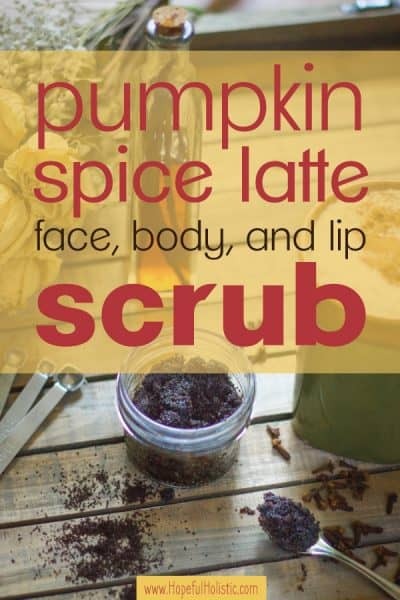 So kick off your Uggs, raid your kitchen cabinets, and try making your own moisturizing pumpkin spice latte face and lip scrub! It’s super easy and so good for your skin. 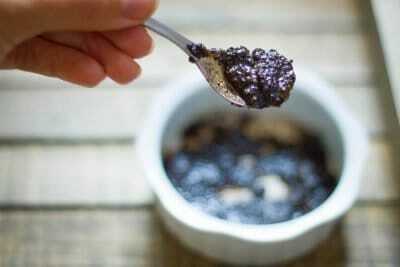 Making a sugar scrub is ridiculously easy. All you need is sugar and a skin-safe oil. You can use any type of sugar (more on that below) and some oils you can try using include sweet almond oil, jojoba oil, or fractionated coconut oil. Mix them until you have a good consistency (it shouldn’t be falling apart or dripping) and you’ve got yourself a sugar scrub! Sugar scrubs make great gifts. And besides, there are about a billion variations. Luckily for you, you’ve found the best one here! This pumpkin spice latte sugar scrub smells wonderful, but it also has some crazy awesome benefits for your skin! 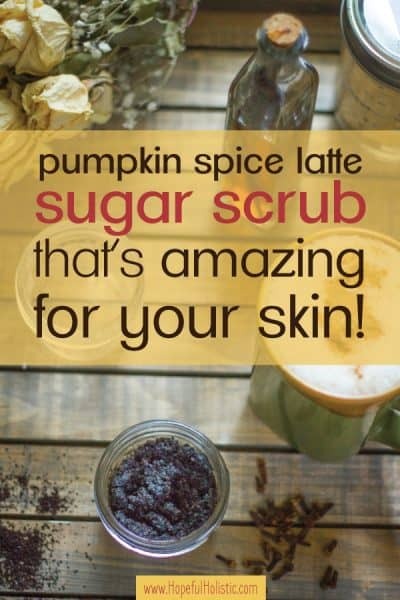 Read on for the benefits you can expect when you start using your pumpkin spice latte scrub! Almond oil also fights acne and sun exposure, and it won’t clog your pores. We’re just one ingredient in and you already have what you need for smooth, soft, healthy skin? Magic! Sugar is also a humectant, meaning when you apply it, it draws moisture from the air around you to help hydrate your skin and keep it moisturized! Bonus benefit? Using sugar this way is also completely calorie- and guilt-free! There’s no need to worry about indulging in your scrub too much over the holiday season! Not to mention, it smells like heaven. What’s not to love? It’s also antibacterial and antiviral, helping reduce your risk of clogged pores and oily skin! Well-known in the health world for its healing and immune-boosting properties, ginger does just as much good on the outside as it does on the inside! And, -oops- this one is also an aphrodisiac! Really, don’t say I didn’t warn you. Also… apparently cinnamon stimulates libido. Another aphrodisiac?? Now this has me wondering, is that part of the reason people are so utterly obsessed with pumpkin spice lattes?? Hmm…. What do you think of these magical ingredients? Each one by itself is fantastic for your skin, so imagine what all of them together can do! Why spend hundreds on anti-aging moisturizers and cleansers when you can get the all-natural benefits from one DIY scrub?? The money you save from DIYing instead of buying expensive products that may or may not work could buy you like… a LOT of pumpkin spice lattes! Here’s the recipe for my amazing pumpkin spice latte sugar scrub! I’ve included notes on ingredient substitutions and what types of sugar or oil to use below. You’ll also find a printable recipe if you scroll down a bit! Put almond oil into a small bowl. Add essential oils to the almond oil (drop in carefully, sometimes the clove can come out fast) and mix well. This will ensure that the essential oils get fully mixed in and are diluted enough so they won’t burn your skin. Essential oils blend best in oil, and they might not mix in as well if you add them to the dry ingredients. Mix all ingredients together with a spoon until blended. Adjust if necessary, adding almond oil or sugar until it’s your desired consistency. 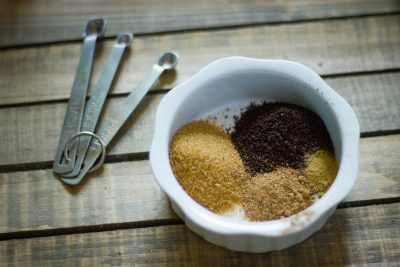 A note on the type of sugar you use: If you’re making a facial scrub or have sensitive skin, you might want to try brown sugar, since it’s softer. Normal granulated sugar is good for your body or face (unless your skin is very sensitive) and raw sugar tends to be a little rougher (more exfoliating power!). 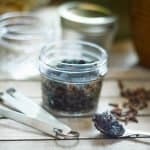 You can also substitute ground cinnamon and clove for the essential oils, but the benefits might not be quite as noticeable. You might need more almond oil if you use ground spices. 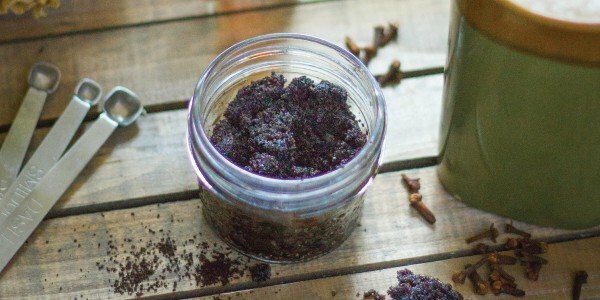 This easy sugar scrub is perfect for the fall and holiday seasons! It's wonderful for your skin and helps fight acne, moisturizes your skin, and reduces the appearance of fine lines and scars. Plus it smells absolutely incredible. Make it for yourself or gift it to your loved ones! If you have sensitive skin, you might want to do a spot test, to see if you have a reaction to any of the ingredients. Just rub some on the back of your hand and let it sit for a little before rinsing it off, and wait half an hour or so to see if there’s any redness or sensitivity. To use your scrub, simply wet your face or wherever you’re using it, and use a dry hand to get about a teaspoon of the scrub. Rub it on in small circles. It shouldn’t hurt- scrub gently. Do this over the sink or in the shower to catch any bits that fall. You can leave it on your skin for a bit if you want, but it’s not necessary. Then just rinse off, and pat dry! Tada! Now you’ve got incredible smelling skin that’s fresh, moisturized, cleansed, and ready to take on the world! To do the lip scrub, same rules apply- you’ll just need a bit less scrub, obviously. You can use a washcloth to rub it around if you’d like. Follow up your lip scrub with some chapstick- I’m in love with this one from Earthley. It doesn’t dry out your lips but keeps them feeling luxurious with mango and cocoa butter, even during the driest parts of the year! If you’re using your PSL scrub as a body scrub in the shower, dry off your hands first. And be aware that you might need to spray your shower to rinse away any leftover coffee grounds! The smell left on your skin should last for a long time, especially if you’ve used essential oils. And if the smell fades? Well shoot, that means it’s time for another PSL scrub! Store your scrub in a sealed container -I like using these jars because I know they’re airtight- and keep it in a cool, dry place. You can keep it in the fridge if you want but that’s not required. Make small amounts and do a facial scrub regularly so that you use it up before it has a chance to go bad. This shouldn’t happen immediately, but don’t let it sit for months! 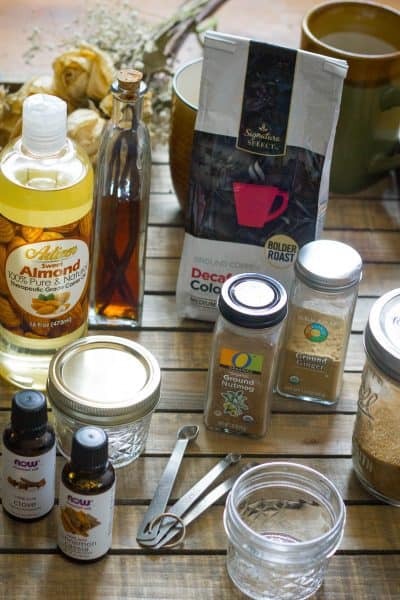 You can add extra sweet almond oil if you notice that the scrub is drying out (the coffee grounds will also soak up a little liquid over time). Your PSL face scrub will also keep longer if you use dry hands (or a spoon) to scoop from it. Water could encourage bacteria growth, even with the antimicrobial essential oils. If you’d like another way to exfoliate your skin easily and with lasting benefits, make sure you check out my post on how to dry brush. And if you’re looking for something festive to DIY, why not give this gingerbread cookie sugar scrub a try? Like this recipe? Share the pumpkin-spicy gloriousness with your PSL-loving friends and family via Pinterest or Facebook!